Your website for many businesses is the first impression of your company for prospects and customers. It’s the first place people go to get to know you, your services, and whether you are the right fit for their needs. Websites, like cars, need to be maintained, checked up on, and optimized for the ever-changing technical and search engine results in which they exist. The age and health of your website may not be up to today’s standards. The frameworks used for your website’s code is constantly being updated to newer versions of software. These advancements must be implemented into your websites software and code in order for your website to work properly on popular browsers, operating systems, and search engines. SSL or Secure Socket Layer is the protocol for which to create a secure connection between a client and the server. Two keys are used to encrypt a cryptographic system to protect the data being sent between parties. If your website is missing these encryptions, it can gravely affect your standing with search engines, as they favor secure sites in their listings. Your site should be optimized for page content, titles, meta data, and many more technical standards for a healthy user relationship. Users trust search engines and having a presence in the top positions for the keywords the user is searching for increases your visibility and your websites credibility. Did you know that 40% of visitors will leave a website if it takes more than 3 seconds to load? Site speed is the most crucial first impression. Site speed can be affected by the website’s code and with your web host. If your website loads slowly your users will quickly close your site and go to your competitor. This can increase your bounce rate which can hinder users from taking action on your site and it can also affect your search engine positions. Mobile search now surpasses desktop search. In fact, by the end of 2018, mobile devices will reach 80% of all internet use. That means if your business’s site does not work on smartphones and tablets, your users can have more difficulty navigating your site which can affect your bounce rate. Your website needs to load quickly and be optimized for an attractive mobile experience that works on both desktop and iOS and Android devices if you want to look professional and optimize your site for mobile search results. Accelerated Mobile pages are the new standard, allowing optimized pages for mobile to load in under a second. Faster load times equate to higher conversion rates and engagement metrics. AMP friendly sites offer powerful benefits for search engine results and the end user. 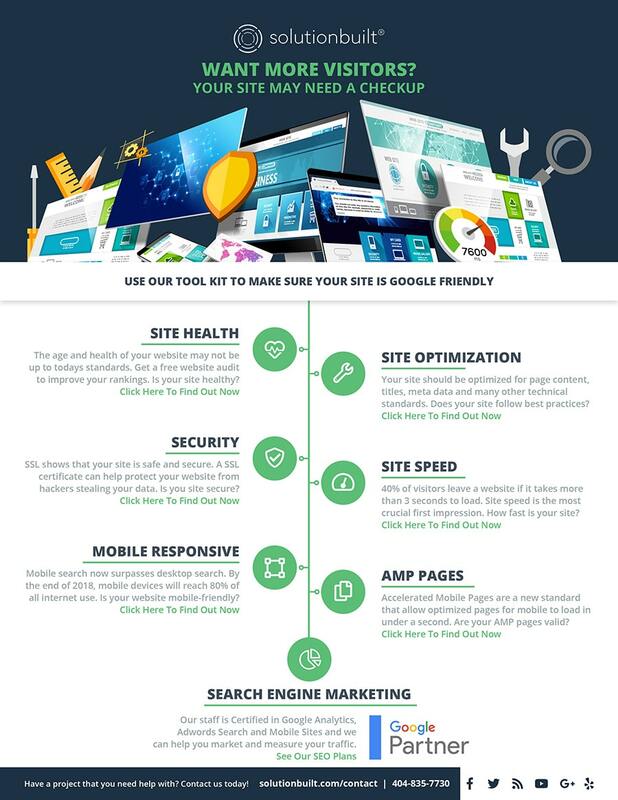 A better user experience, heightened site speed, and most important of all, a competitive edge for for your business. We know this is a daunting list of seemingly endless information. Well fear not! Here at SolutionBuilt, we have the team, the experienced know-how, and the tools to tackle all of your website maintenance and marketing needs for your business. Just call us and we can provide a complimentary audit and a plan to make sure your website is ready for the search engines while helping you attract, measure and engage users to maintain and grow your business. We even made a nifty little tool kit for you to use! 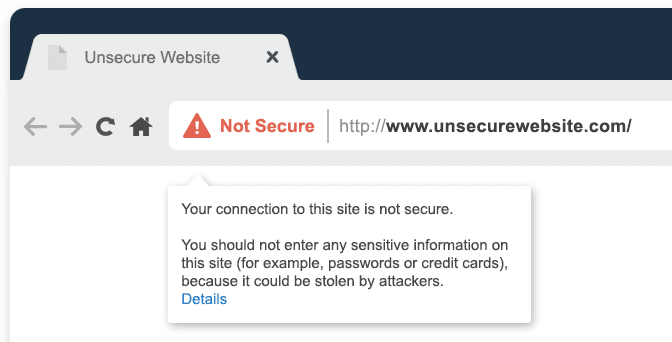 These links will help determine your website’s most vulnerable and broken areas and will point us to the fixes necessary to get your site at the top of the class. Click here to view the Tool Kit PDF. Remember, we are only growing as a society and that means more and more online commerce, information, transactions, and usage. The World Wide Web and the search engine listings are growing making it more competitive for many businesses as they shift from traditional advertising methods to a more cost effective, measurable, and direct advertising source. Most users start and end their search on the web and now more than ever it is critical that you not only get your website listed on popular search engines like Google but it’s also important to keep your website healthy with regular content and and maintenance. SolutionBuilt is an Atlanta web design and development company that provides web design services since 2004. We specialize in custom website development and provide all services for SEO-friendly websites, including website design, custom website development, and online marketing campaigns. This include responsive design, website redesign, WordPress maintenance, and more. As a top web design company in Atlanta, our team of experienced digital marketing and web strategists are dedicated to creating unique digital experiences through strategy, design, and development. Call us today at (404) 835-7730 to discuss your website maintenance needs!